New Summer Shades From American Apparel! I noticed some new shades on American Apparel's web site and they look perfect for summer! They also have added a top coat to their polish collection. I want all of them, but I have so many untried's lined up, I'm going to try to hold off. How about you? Do you see any you might want? "The first 18 colors of our nail polish line were an experiment˜we picked colors that were beautiful and didn't set out to necessarily match them with anything. For summer, we saw an opportunity not only to add a few new colors, but also to develop some fresh shades that can coordinate with the tones of our new styles. We're proud that by listening to the feedback of our employees, customers and the online community, we were able to create a summer range that incorporates their ideas and expresses the palette we presented this season," said Marsha Brady, a creative director for American Apparel. American Apparel Nail Lacquer has been an exciting success for the company as it has expanded its aesthetic into new areas and styles. The initial run of 18 colors and 50,000 bottles quickly sold out worldwide and developed a loyal following of fashion bloggers and polish artists. By working with a California manufacturer near its headquarters in Los Angeles, American Apparel continues its commitment to the idea of Made in USA polish and hopes the new colors will be met with the same glowing reviews. "The public has had an overwhelmingly positive reaction to our nail polish collection and we're excited about these new additions. As we translate our basics model to fashionable pieces and new kinds of products, we remain dedicated to maintaining the same level of quality and dependability that we're known for. The colors have the potential to enhance outfits in both classic and atypical ways and we're really look forward to seeing how people wear them," Brady said. 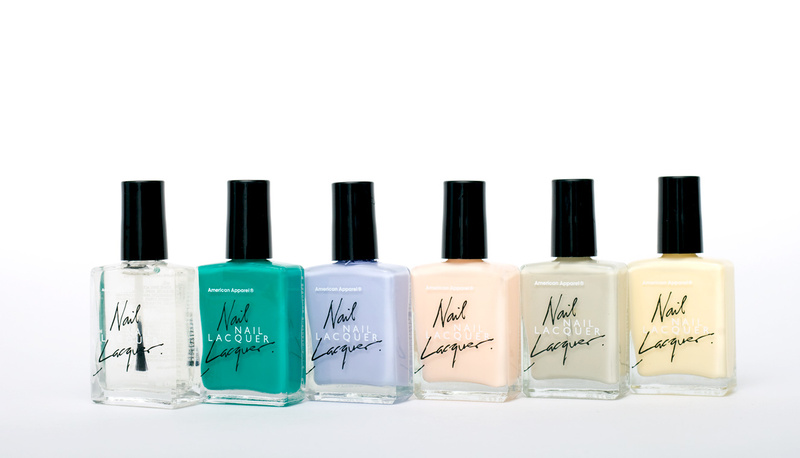 American Apparel Nail Lacquer is priced at $6 per bottle and is available in a 3-pack for $15. It is sold at American Apparel stores worldwide as well as online. The nail polish is DBP, toluene and formaldehyde-free. The full color range, ingredients and photographs can be found in the American Apparel web store. I think I'm in love with Butter. It's a yellow my skin tone can totally rock! Malibu Green is pretty...but probably a dupe of something. Still, I'll have to check it out. they have nice colors, but you can find a dupe or near-dupe to most in a much higher quality polish. all three that i got all chipped in well under 24 hours, even though i typically polish daily i can easily get five days out of a manicure when needed. not with these! i also found the brush to be impossible to deal with, worse than a 99 cent wet n wild brush. big let down here. I don't own any of this brand. I have lots that look like these. I won't be starting up with another brand. I like the previous collection. That was really tempting. Elizabeth~that yellow does look like a great shade--like you said, it may work for me too! You should get it and let me know how it looks~ha-ha! amanda~that's too bad they didn't work for you. The first few I tried late last fall I think, were a little thick. Other than that, I've not had problems with mine. But yes, I do love the WnW too! Lucy~I like their colors, but I would like to see them come out with something other than creme finishes.